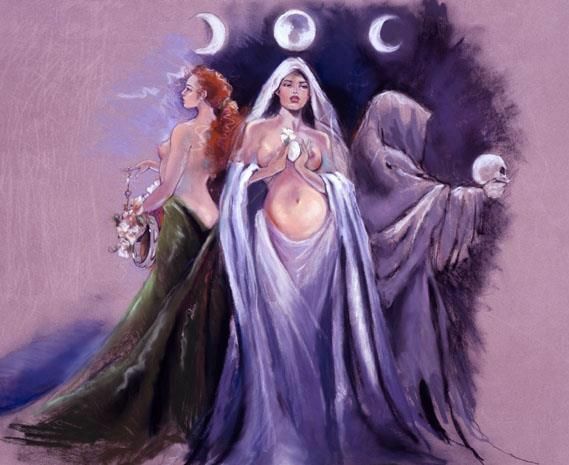 In many Wiccan traditions, The Triple Goddess is recognized and honored as a triadic deity consisting of three aspects: The Maiden, Mother, and Crone. Each of them represents the energy of the major stages in a woman’s life, and correspond to the three phases of the moon; Waxing for the Maiden, Full for the Mother, and Waning for the Crone. The Maiden represents the waxing moon; she is the birth of a new cycle, she is the seedling and the fresh energy of youth. She is associated with childhood, innocence, virginity, new beginnings, creativity and potentiality. The maiden’s focus is on self-awareness and developing her own strength, knowledge, and talents. The two sabbats associated with the Maiden are Imbolc and Ostara. Her element is Air, and her season is Spring. Any rituals invoking the Maiden goddess should be performed during the ascending (waxing) moon, which is a particularly potent time for Air magick – creative expression, singing, making wishes, and seed planting rituals. The Maiden is a 100% organic soy wax crystal candle, made from a delicious and feminine peach nectar fragrance. In ancient cultures Peach symbolizes longevity and happiness. It's infused with Peach Blossom flowers, Yellow Chrysanthemum flower, Red Carnelian, Fire Agate chips, and magick. ☽ Carnelian encourages acceptance of the cycle of life and helps remove the fear of death. As an ancient stone, it was used to protect the dead on their journey to the afterlife. It gives courage and promotes positive life choices. ☽ Fire Agate helps manifest Divine guidance through action and assists one in taking decisive action in unclear circumstances. It increases passion, emotions, and reconnection to one's deepest desires, and provides the courage to take risks to fulfill those promptings. It is ideal to banish the stupor of a humdrum routine. ☽ Peach Blossom: Promotes beauty, protection, and self-love. Candle Magick (Peach, Salmon) this is a mixture between pink and Orange, so It has both of their color attributes. Pink manifests love, devotion, friendship, and faith and Orange, is the color of growth and sudden change. It confers upon those who dare to wear it, a form of super-power.